July 2018. We report a THz QC-VECSEL with over 1 Watt of output power in a high quality beam with 60 GHz of single-mode tuning. Link. Dec 2017. Our VECSEL makes the cover of IEEE Journal of Selected Topics in Quantum Electronics. Sept. 2017. Our paper ”High performance terahertz metasurface quantum-cascade VECSEL with an intra-cryostat cavity” is chosen as “Editor’s Pick” in Applied Physics Letters. Link. June 2017. Congratulation to Luyao Xu for receiving her Ph.D., Jiawei Wang and Yujie Lin for receiving their M.S. and to Daguan Chen for receiving his B.S.! May 2017. Luyao Xu has been awarded the UCLA EE Department “Distinguished PhD Dissertation Award in Physical & Wave Electronics” for 2016-17. Congratulations! April 2017. We report metasurface lasers with electrically switchable polarization in Optica. Press release. April 2017. Congratulations to incoming graduate student Parastou Mortazavian on receiving the NSF Graduate Research Fellowship! Link. October 2016. We report high brightness and efficiency THz QC VECSELs with focusing and amplifying metasurfaces. Link. Prof. Williams will give an invited talk at Photonics West 2017, and invited tutorial at OTST 2017. A video of the Photonics West talk is available here. Sept 2016. Congratulations to Dr. Benjamin Burnett for successful completion of his Ph.D. ! June 2016. Congratulations to Luyao Xu for being awarded the UCLA Dissertation Year Fellowship for 16/17! September 2015. We report at ITQW 2015 the first demonstration of an external cavity laser based upon an amplifying reflectarray metasurface - a THz VECSEL. It is published in Applied Physics Letters. 2015. Congratulations to Luyao Xu for winning a 2015 SPIE Optics and Photonics Scholarship! May 2013. Congratulations to Amir Ali Tavallaee, for winning the EE department’s “Distinguished PhD Dissertation Award in Physical & Wave Electronics” for 2012-13! March 2013. Our paper on “Radiation Model for THz Transmission-Line Metamaterial QC-Lasers” wins 2013 IEEE Trans. THz Science and Technology Best Paper Award. January 2013. We report the first THz active composite right/left handed (CRLH) metamaterial waveguides in Applied Physics Letters. January 2012. Prof. Williams wins NSF CAREER award. April 2011. Our upcoming talk on active THz metamaterial waveguides at SPIE Defense, Security, and Sensing (DSS) Conference is featured in the SPIE Newsroom (April 11 2011). July 2010. Our proposal for THz metamaterial lasers has been covered in Nature Photonics "Research Highlights”. March 2008. Prof. Williams wins DARPA Young Faculty Award. September 2007. 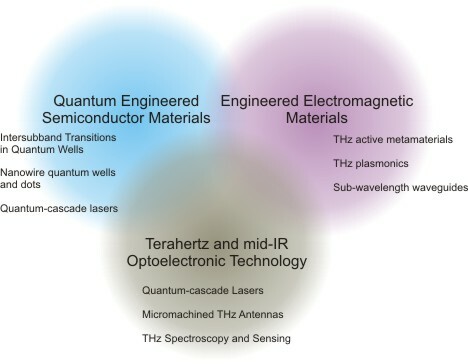 Nature Photonics publishes a review paper on THz quantum-cascade lasers. The terahertz frequency range lies roughly between 300 GHz and 10 THz (between the microwave and infrared spectra), and has seen comparatively little technological development in large part because of the great difficulty in generating and detecting THz radiation. THz radiation is of interest for chemical and biological sensing, security screening and explosive and drug detection, astrophysical probes of the early universe and star/galaxy formation, medical imaging, nondestructive evaluation of materials, industrial inspection, and short-range high-bandwidth communications. This convergence of interests is epitomized by the quantum cascade laser, an intra-band semiconductor laser for which the wavelength of light is not determined not by the bandgap, but rather is chosen by engineering electronic states in coupled 2D quantum wells - i.e. by creating "artificial molecules." The ITQW 2019 Conference (Infrared Terahertz Quantum Workshop) will be held in Ojai, California from September 15-20, 2019. The theme of the conference is broadly defined as the exploration of novel physical phenomena in quantum- and electromagnetically-engineered photonic materials in the infrared and terahertz frequency range and the exploitation of these phenomena to create novel optoelectronic devices and applications. This conference is the evolution of the “Intersubband Transitions in Quantum Wells” Conference, held every two years since 1991, and is the premier small conference for intersubband physics, devices, and systems, including quantum cascade lasers. The conference is being organized by UCLA, with Prof. Williams as General Chair. More information at www.itqw2019.com .